(22055.21832, Ray Jacoby Collection, OHS). Cyril is located in the southeastern corner of Caddo County, fourteen miles south of Anadarko, twenty-five miles southwest of Chickasha, and about twenty-five miles northeast of Lawton. The town is situated at the junction of U.S. Highway 277 and State Highways 8 and 19. Originally built on eighty acres of the allotment of the infant daughter of Bayard Lookingglass, a Comanche, the town of Cyril was platted in late 1906 by E. S. Pearson, C. A. Nunnelley, Dr. M. H. Eden, and A. A. Hiatt. The townsite opened to settlement in 1907. The surrounding agricultural community provided a basis for Cyril's economy in the early years. Important crops included corn, hay, melons, cattle, hogs, and broomcorn. The town was located on the Oklahoma City and Western Railroad line (after 1907 a branch of the St. Louis and San Francisco Railway) line between Oklahoma City and Lawton. In 1918 an oil refinery was constructed in the community to handle the output of the nearby Cement Field. Operated by the Anderson-Pritchard Refinery Company from 1922 until the late 1970s, the facility quickly became Cyril's economic mainstay. 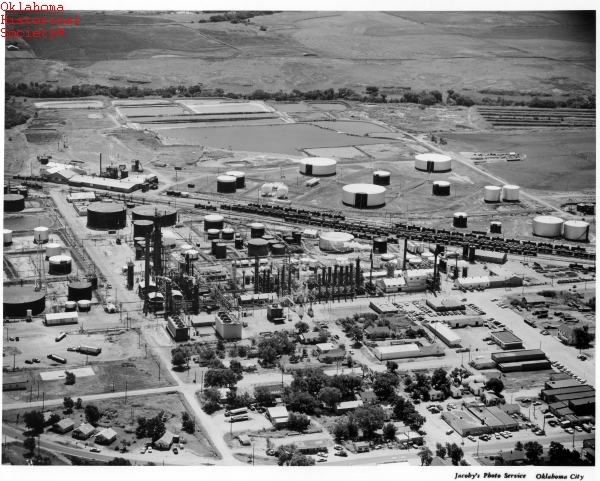 Purchased by the Oklahoma Refinery Company in the late 1970s, the refinery continued in operation only until about 1987. Despite numerous plans to bring it back into service, the plant remained in disuse until its demolition in 2004. Because it had the refinery, Cyril is one of thirteen industrial sites in Oklahoma named as an Environmental Protection Agency Superfund site. The town was put on the list in 1990, and at the end of the twentieth century cleanup activities were ongoing. Within a year of the town's founding there were nearly 200 persons living in Cyril. In 1917 an unofficial count of citizens put the population at 525. The first federal census to include the community was that of 1920. At that time, the population stood at 386. With the opening of the oil refinery the population nearly tripled, reaching 922 by 1930. Growth in the 1930s and 1940s was notably less, but the community gained a few residents, reaching 972 by 1940 and 998 in 1950. The 1950s brought another boom for the town, as the population swelled to 1,284 in 1960. Although only rising by eighteen persons, the 1970 census represents the peak of population at 1,302, a number that declined to 1,220 in 1980 and to 1,072 in 1990. The community rebounded in the 1990s to reach a population of 1,168 in 2000 but declined slightly to 1,059 in 2010. There have been several newspapers in the community with the Cyril News still serving the town at the end of the twentieth century. Other papers have included the Cyril Advocate, the Cyril Enterprise, the Cyril Pioneer, the Cyril Courier, the Caddo County News, and the Cyril Weekly News. The current form of city government is commission. Mildred Cole et al., A History of Caddo County (N.p. : N.p., 1955–56). "Cyril," Vertical File, Research Division, Oklahoma Historical Society, Oklahoma City. Daily Oklahoman (Oklahoma City), 23 September 1917, 20 February 1932, 14 July 1997, and 7 March 2004. Bill Patterson and Darlene Patterson, A History of Cyril (Cyril, Okla.: Cyril Publishing Co., 1976). Cynthia Savage, "Cyril," The Encyclopedia of Oklahoma History and Culture, https://www.okhistory.org/publications/enc/entry.php?entry=CY001.